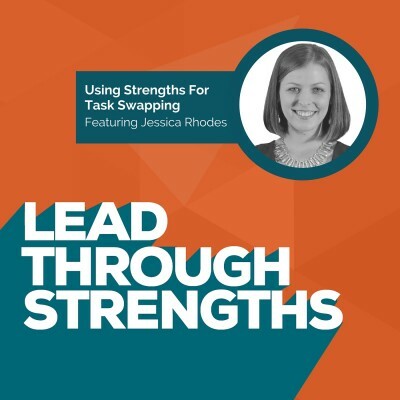 Jessica Rhodes joins us to show you how to apply your top strengths. She also shares some magical ideas for uncovering the natural talents of people on your team. You’ll find this episode especially useful if you’ve had your team take the StrengthsFinder survey, yet wondered how to actually apply strengths to real-world situations to improve and grow your business. Jessica is an inspiring guest, who encourages you to experiment. She helps you change things up, use your strengths to maximize potential, and to increase profitability. As we’re expanding our StrengthsFinder team in Austin, Texas and around the world, this interview was helpful for us too. It was a great mix of strengths-based development, hiring tips, and awesome chats about growing as a leader. Start with you. Understand both your strengths and weaknesses. Use your strengths to move you to where you want to go. And hire people who are strong in the areas where you’re weak. This leads to a well-rounded team (and keeps you from having to perform tasks you hate)! Use your strengths to achieve your goal. Jessica shares the first major goal she achieved after completing the StrengthsFinder Assessment. Knowing that she was going to be on maternity leave in nine months, she set the goal to have her company not only be surviving, but experiencing a strong level of growth, even while she was taking care of her family. Try Task Swapping. Find the right team members, and match their job responsibilities with their strengths. Sue did fine when she started, yet she really started exceling when she became the Director of Client Happiness. It was a perfect use of Sue’s Positivity, Woo, and Communication talent themes. Jessica also asked Sue to use those talents to create customer onboarding packets and to run their client gratitude program. Cathy did fine when she started, yet she really took off when Jessica started tapping into her natural talents. Jessica used Cathy’s Input and Learner talent themes when she made Cathy the official hub for software training on the team. It allowed Cathy to get energy from being a curator. Jessica helped her invest in her Developer and Strategic talents to create new systems and trainings that would serve the business in the long term. Make It Rain With Change. Realize that while some people enjoy doing the same task every day, others get easily bored. If an employee gets bored, change their responsibilities so that person has a high level of variety. Then watch to see how much that person’s productivity increases (and it will). Show You Care. Value your employees and listen to them. Employees respond well when you’re investing in them. It makes them feel cared for and more loyal. Tap Into Their Quirks. Match employee strengths with tasks. They’ll be stronger at their jobs. And they’ll be happier, which will make you happy too. Jessica stressed learning, thinking, and “keeping your ears and eyes open” to see how things play out. Consider How Talents Impact Relationship Building. Match your team members with clients carefully. When teammates and clients are a good mix, you can create a positive bounce in your business. Create a Culture of Trust. Encourage employees to speak up when they’re unhappy about tasks. They’ll feel trusted to apply their own strengths and to work around their weaknesses. This helps you to implement change to keep them happy. It will keep your clients happy as well. Feel The Strengths Love. Use employee strengths to solve differences. Jessica shows how to use understanding of a fellow employee’s strengths and weakness to solve conflict in the office. Why Strengths? According to Jessica, the benefit of understanding and utilizing strengths-based development is that you’ll be happier! If you are around people who enjoy what they’re doing, you’ll be happy and have more positive results. Check out Jessica’s weekly web TV show, Interview Connection TV and listen to her weekly Rhodes to Success podcast. You can also follow her ideas on Facebook and Twitter. Lisa Cummings: [00:00:06] You’re listening to Lead Through Strengths where you’ll learn to apply your greatest strengths at work. I’m your host, Lisa Cummings, and I’ve gotta tell you, whether you’re leading a team or leading yourself, it’s hard to find something more energizing and productive than using your unique natural talents every day at work. [00:00:24] Today we’re taking it to the street. Oh, my gosh, that makes me think of that Doobie Brothers song, “Takin’ it to the street.” Okay, so. Jessica Rhodes: [00:00:33] Do you sing in all your episodes? Lisa Cummings: [00:00:35] I’m singing constantly throughout the day, not well but just random songs, it’s like my life is a song. Your guest today is the CEO of Interview Connections and you just heard her theme song. So she’s going to join you to share how she’s used a Strengths-based approach on her team. [00:00:52] And you guys tell me all the time that you love the idea of StrengthsFinder or the idea of noticing what works on your team then you don’t really know what to do with it other than read the report or see definitions of people’s talents. You tell me you feel stuck when it comes to putting this into action, or maybe you get busy with life and you don’t really dedicate the intentional focus to it so your excitement starts to fade away and then it becomes a lack of implementation. [00:01:19] Well, your guest today, she’s totally taking action. She’s experimenting and she’s here to share those ideas with you. We actually met because I saw her putting these Strengths to use on her team in really practical ways. This woman, such a powerful force. So powerful they named the state she lives in – Rhode Island. They named a place after her. So, Jessica Rhodes from Rhode Island, welcome to the show. Jessica Rhodes: [00:01:42] Thank you so much for having me. I geek out about this stuff, so I could not be more excited to be on your show. Lisa Cummings: [00:01:50] Oh, this is perfect. So you geek out on it; you use it at your company. How did you first come across it? Jessica Rhodes: [00:01:55] Going back, my major in college was Strategic and Organizational Communication with a focus in Organizational Leadership. Jessica Rhodes: [00:02:02] So dating back to college I always geeked out around management and leadership and communication. So, I just found out about StrengthsFinder over the summer. I listened to an episode of The Smart Passive Income podcast with Pat Flynn. He interviewed Michael Hyatt and they talked about StrengthsFinder. And the way Michael describes StrengthsFinder, it sounded like such kind of a simple and easy to grasp concept. [00:02:30] I was familiar with the Myers-Briggs and the DISC assessment, and all that seemed really big and complicated. And I knew I needed something like that with my team as I was growing it, and StrengthsFinder seemed like something that I could grasp and implement without a whole t o-do of bringing in a consultant and doing a whole training and everything. [00:02:49] So I heard about it on a podcast, got the book for myself, took my own assessment and I was super interested in learning more about myself, reading my Strengths, “Oh, I am so that,” then I decided to actually bring it to my team. Lisa Cummings: [00:03:04] Oh, that’s so cool. Okay, don’t leave us hanging on the, “What the “that’s” are?” Give us your top five Talents. Jessica Rhodes: [00:03:09] Okay. So my number one top five Strength is Communication, which was not a surprise to me. I told you what my major was. And number two is Futuristic, number three is Achiever, number four is Activator, and number five is Maximizer. Lisa Cummings: [00:03:26] Yeah. You know, I can even see those. I watch your videos that you post on YouTube and you have the quick tips, and I was thinking of it the other day after learning about your Talents and thought that is so perfect for Achiever and Activator together. Somebody wants to get stuff started but also get stuff done at the same time, and you can post a lot of things and actually kind of start and then not labor over it. [00:03:50] You’re not posting an hour-long video that you’ve labored over for five weeks with lots of editing. You make it raw and real and your communication shines through naturally, and it’s so perfect. I was watching them thinking, “Oh, my gosh, they’re just shining through,” watching how your channel works. Jessica Rhodes: [00:04:07] Yeah, and I was re-reading about my Strengths this morning and the Communication section, it was saying that somebody with this Strength they like to explain, describe, host, speak right, and I’m like, “Yes, yes, yes, yes, yes, yes.” And then people with the Communication Strength, they believe that people have short attention spans and they really want to get their message across. That is so true. [00:04:30] And I do it in those short bites, at least my blogposts are pretty short and to the point, same with my videos. So I was reading that and thought, “Yeah, that is definitely my top Strength,” and I’ve been a talker since day one, so. Lisa Cummings: [00:04;42] [laughs] I love it. I love how they resonated instantly. Lisa Cummings: [00:04:47] Okay. When you and I were chatting the other day, you even mentioned that these Talents, the words you used were they make you feel like an unstoppable force, so that is so cool – unstoppable force. Did it feel like that from the beginning for you? I know it’s only been this summer, but from the beginning of looking at them, you’re like, “Wow, these really are my super powers?” Or did you have to read and get comfortable living into them? What was that like? Jessica Rhodes: [00:05:13] Well, once I figured out what my top five Strengths are, and I read about them, I started to think. And it was kind of cool that happened in the summer because I remember sitting outside. Outside allowed me to kind of relax a little bit more in the summer. As I was learning about these Strengths and thinking about them, I started seeing how they play out in my life. Like my second Strength is Futuristic, and as I was thinking about that I remember telling my husband, “Look at this. This Strength is so cool. This is my Strength. Do you see how I am so Futuristic?” And I tell him examples like, you know, Futuristic, you have something in the future that you are driven towards. [00:05:51] And I’ve realized that in my business I am most productive and do the best in my business, increase my revenue and all that good stuff, when I have something specific that I am working towards. I realized that. Wow, I respond really well to having something in the future. Not like, “Oh, five years down the road I want to buy a big house.” But, “Okay, in nine months I need this to happen.” And so, all the sudden, I have this like insane energy and drive this week because I have this very specific goal that I want to achieve in nine months. Lisa Cummings: [00:06:23] What a cool way to apply the language that you get out of it, because for people who may not be familiar listening, the StrengthsFinder doesn’t give you results that tell you what to go do with your life but they tell you how you tend to approach things, like what are your natural patterns, your natural thoughts behind it. So it gives you these words and these filters to think, “Okay, yeah, how could I lead through that?” And it’s exactly what you did, “How could I use this Futuristic talent to achieve what I want to achieve in life?” What’s your favorite one, when you think about the list, just the one that really stands out to you and feels most like you? Jessica Rhodes: [00:06:58] I think that the Communication one is probably the one that is most like me. I saw that when I took the assessment and I just thought, “Oh, okay, that’s definitely it.” From everything I’m doing now in my business, like I mentioned I’m blogging and I’m doing the videos and the podcasts, and I also am very much a communicator within my team. Like when I need to make an announcement or do a quick tutorial of our CRM or something, I’ll type it up, record my screen and speak through it. [00:07:29] So I try to be able to communicate to my team in all different ways as well because I know I have team members who are very visual and they need to see the video. And then I have team members who need the written down points. So when I saw that Strength, I thought, “That makes total sense,” because I want to be able to communicate everything in all different ways to my team. Lisa Cummings: [00:07:49] Yeah, and it shows up perfectly, if you think about using your Talents, all the stuff that you focus your energy on, the doing things that you’re doing in your business all relate to a Communication Talent? You know, other business owners, let’s say they’re high in Analytical Talent, they might spend their time thinking about how to go to market, or looking at analytics, and finding the most efficient path to X results. Jessica Rhodes: [00:08:33] Yeah, and the other Talents – Achiever, Activator, Maximizer – this maybe when you’re talking about people that are analytical, I am not the best person to sit down and look at my stats and look at how many people are visiting my website and what’s the conversion rate. That is not my strength at all, because I see those numbers and I’m just like, “Oh.” Like I said to my husband, my husband is my CFO so he does all my books, and he’s the one that’s great at looking at the numbers and the data and planning all that stuff out. [00:09:00] And he’ll consult me on data things, and I said, “Can you just let me focus on marketing and growing the business and making money because I’m really good at that? But my Strength does not lie in looking at the data.” I very smartly say, “I trust you to make the right decisions,” but I guess sometimes you do have to go back and look at the data but it’s definitely not my Strength to be very analytical. I just want to focus on maximizing and achieving and getting my message out. Lisa Cummings: [00:09:25] Yeah, you’re doing it in a really smart way. You either partner up with somebody who has that genius or work around it and found the magic in doing that. And you’ve talked a little bit about implementing a Strengths-based approach with you, a little bit by partnering because of your CFO and husband relationship there. You’ve also implemented it with other team members. Let’s talk about that. [00:09:46] Something was different about you. You didn’t take this as a simple assessment and say, “Okay, that was interesting,” and then put the report back in the drawer. You looked at it, got a little bitty drip in a giant ocean of things you could do with this. So how did you first start to apply this on the job, and actually do tangible things with it? [00:10:36] And so as my team was starting to take this assessment, and I would read about who they are, it immediately educated me on who they were, because you work with people. To back up a second, my business is virtual so I have met a few of my team members in person but a lot of them I have never met them in person but we have spent so much time together over the phone and over email and working together virtually. Lisa Cummings: [00:11:15] I met you, and in a really simple way see you implement this through one of your team members Sue. And for all the listeners, Sue is the director of Client Happiness there at Interview Connections. And the first thing I noticed was like, “Wow, she genuinely does seem happy.” So interesting that’s in her title. And then as I talked to her more, it was like someone at Burke said, “May the happiness force be with you,” and she couldn’t help herself from being that way. And it struck me because so many first interactions with companies are really canned and stuffy, and she seemed so different. [00:11:48] Now that I know more, I think it’s because you tapped her natural talents. And context for the listeners, Sue’s Talents are Positivity, Woo and Communication, are a few bits to me that just speak to the title and interactions, so it’s just so perfect. Tell us about your process. Yeah, how did you discover these in them? And then after sending the book and having them read it, what did you do? How did you start to apply it, and actually take the insight that you mentioned where you said, “Oh, that’s why they do this”? Well, then what did you do with that thought? Jessica Rhodes: [00:12:18] Right. Sue is a great case study. I know she’s going to love listening to this episode. She’s a great case study because she is someone that when I hired, it took her a little while to learn the job, and learn the tasks that I need her to do. A lot of the things I hired her to do didn’t quite come naturally, and it was only after we started tapping into her Strengths that she really, really started to thrive. So I guess I got the StrengthsFinder book in maybe July or August and I had her take it. And by September-October, her results in my business just skyrocketed and it just was really, really great. Lisa Cummings: [00:14:29] Great idea. Jessica Rhodes: [00:14:31] Listening to people’s podcasts and coming up with compliments and praise and also feedback. So we don’t just say, “Hey, you’re amazing,” but we say, “Hey, here are all these great things we love about your show and your interview, but maybe you could do this to help make it even better.” So it’s kind-of playing into that Maximizer Strength that she has, in terms of helping them nurture their strengths and be better at their interviews. [00:14:55] And so that is just one thing we had her do. And then the other thing is having her send out welcome packages and managing our gratitude program. So I put a lot of focus in my client retention, and one of the things we’re implementing is sending out gifts to our clients in the mail. When they come on board, we’d send them a package in the mail. And so I’m having her take that over because – and I’m not sure if there’s a specific Strength that I read that makes sense, but I know that she cannot be at the computer eight hours a day. [00:15:26] But that doesn’t mean she doesn’t want to work more than four hours a day. She just doesn’t want to be sitting in front of the computer, so I’m having her manage the welcome packages because it’s just going to have her going out to the Post Office, and sitting in her living room like assembling these packages. So those are just a few of the things that we did to adjust Sue’s role with the company, and it’s making her a lot happier, and it’s really contributing to the value of the company because there’s all this stuff getting done. Lisa Cummings: [00:15:54] Yeah. First, to start with the praise part, such a good use of thinking about tasks that you could align with her Talents. Being able to make videos with Woo and Communication and Positivity to win over – and for anybody who’s on the line and doesn’t know what Woo is, it stands for Winning Others Over – that she’s actually helping win over your clients and your future clients with these videos, the Positivity, it gave you the insight into where she’s coming from when she makes conversation in the workplace. That thing that you mentioned when you said you noticed those quirks and go, “Oh, that’s why. That explains this thing.” Those are such subtle moments. [00:17:03] And you’ve done so many cool things. I love that you’re experimenting with tasks and responsibilities too, because some people are afraid of doing that, and they think that, “Well, I’ve created the role. I just have to find the person and they need to the job as is.” Being flexible with tasks and swapping them out can be so powerful if you give it a shot, and see what aligns with people’s talents. [00:17:26] Now, Sue mentioned to me that you have your Strengths on display for each other also. How does that work? Rhodes: [00:17:34] Yes, so we use Highrise which is a customer relationship management software, and so our team, we’re all in there all day and logging our contacts and our communication with people. We decided that everyone who has taken the StrengthsFinder tests will put their results in Highrise so you could go to my profile in Highrise and see what my Strengths are. [00:17:59] It’s interesting, as we were taking these assessments, I remember when I had Cathy take it and Natalie take it, I said, “Okay, go read Sue’s Strengths and go read my Strengths.” And then it was really interesting, it helped them get to know each other, so it’s been just really life-changing for our team to have those Strengths on display and to learn about one another. Lisa Cummings: [00:18:19] I love that you’ve taken that simple step too. Putting them on display will just get them to listen and consider. I’ve heard a lot of stories from clients with the same kind of thing. I had one recently where I had a person with really high Adaptability and a person with really high Consistency, and they’re butting heads because one wanted the doc to be the same because the processes mattered, and this was the Consistency person, needing and wanting things to be similar so they knew what to expect. [00:18:47] And then the Adaptability person needing things to change and to be able to go with the flow and figuring out how to not create an environment that drove the other person crazy just in the way they approach their work. But knowing that those were kind of drives for their lives that they felt all the time and that they were going to be angling their work toward that end. Lisa Cummings: [00:19:41] So what else have you done to put this into practice, just your real, tactical, tangible things you’ve done with Strengths? [00:20:43] As a Learner, she wants to learn new systems. She really thrives when she takes a piece of software or something, and figures out how to learn it. So I invested in someone to train Cathy because I knew that, if part of her job was to learn everything about this program, she would really dig that. She would really love the opportunity to learn about it. And so I’ve had her do that with several things. When we started using Highrise, she got in there and learned all about it, learned all the features, and she’ll run trainings with our team, and she’ll have calls with individual team members training them on how to use it. [00:21:47] People come to us because they know that this is something they should be doing. And Cathy, I believe, is so great at sales, our sales calls, because she gets on the phone with people and really shows them how our service is going to help them grow their business. Since working with me she’s learned all of the marketing and learned. Really, I call her my right arm sometimes because she’s been watching my videos and learning all this podcasting that I know, so she can then communicate that to potential clients. So those are just a few of her Strengths. [00:22:21] She’s Strategic, that’s one of her Strengths, and whenever I have something I need a sounding board, she’s the sounding board of the team. Really that should be her title – Sounding Board Cathy. I will call her, other members of the team will call her and just say, “Hey, I got to run like an idea past you,” and she’ll listen and give her input. That’s a lot about Cathy, and I really just make sure to keep playing to her Strengths, and adjusting her role accordingly. [00:23:14] So it feels as if your understanding is really deep of their Talents. Did you read the report and just go, “Well, this is what it says. Here’s an idea. Let’s see if this appeals to this person”? Did you have one-on-one conversations to feel this out? How did you get so good at matching the tasks and the role with the Talents that you were reading about? Jessica Rhodes: [00:23:37] So with Sue, a lot of these new roles came after that StrengthsFinder assessment, but it didn’t come right away. I didn’t read her Strengths and thought, “Okay, now we’re going to have her do all these tasks.” It kind-of came, you know, you learn it, you kind of let it percolate a little bit, and you start to just keep an ear and eye open for opportunities where those Strengths could play out. [00:23:56] With Cathy she had already been adjusting her role to these Strengths, because I don’t know if one of her Strengths makes her this way, but she takes initiative. It does take time. I didn’t read the assessment, I thought, “Okay, this is what we’re going to do.” But after having the information, always keeping that in the back of my mind, it was helpful. [00:24:13] One part of the StrengthsFinder book that I find really helpful was the end of each Strength section of how to work with someone with this Strength. Jessica Rhodes: [00:24:22] So those sections were so, so helpful because you could read about someone’s Strength, like what the Strength is, “Okay, that’s how they are.” Or as I read folks’ Strengths, I would read how to work with this person so I would learn about how to communicate with them better. I guess just as we were aware of these Strengths, we would start to think about how they might be implemented. [00:24:44] I do remember with Sue because she was really enthusiastic about this idea of the StrengthsFinder test, and I remember her coming to me and saying, “Hey, are there opportunities to advance within the company?” This is a small business, I founded it three years ago, so I’m thinking, “Well, any role that you advance to is a new one.” Because you don’t start a business and immediately have like all these positions to fill, it’s all very organic. So I thought, “Okay. Well, let’s learn your Strengths and let’s talk about it. Lisa Cummings: [00:25:40] How did you make sure that the stuff would percolate? It was very cool that that just came to you, “Oh, yeah, this thing is happening. I thought of Cathy.” A lot of times managers will do this to get psyched about at the beginning and then life gets really busy, work gets really busy, and they kind of forget about it for a while, and it takes some event for them to go, “Oh, yeah, I meant to focus on that.” How did you keep it in front of you? And how did you make sure you would keep marinating on this stuff? Jessica Rhodes: [00:26:08] Yeah, that’s a really good question and I don’t know if I have the best answer for it. I guess, for me, because I have a service-based business and I have a lot of clients that I cannot personally serve, I need a team that’s really invested in the success of the business. So I just know that if my team is not enthusiastic about their work, they’re not going to produce results. [00:26:33] Our work is very much sales, we deliver a certain number of bookings a month, so if we’re not meeting those bookings our clients are going to leave. And if my team members are not invested in the success of the business it’s not going to show, the results are not going to be there and clients are going to leave. [00:27:12] So I try to just make that clear up front and keep in check. It’s very obvious on those Monday team calls, they’re on video. If someone is not talking much, we say, “Okay, how’s your week going? What’s going on?” and they give one-word answer that is a huge red flag for me, so I really, really keep an eye on that. So I guess it just goes back to my Communication Strength because I’m trying to make sure that I’m just keeping a tab on everyone’s enthusiasm level and their interest in what they’re doing. And I guess the reason I made sure I kept implementing this is because the success of the business depends on it. Lisa Cummings: [00:27:45] Yeah, you just seem to get innately that notion that in order to do the work, you need to focus on people doing the work. Lisa Cummings: [00:27:53] Mm-hmm. So last question for you. As you’re thinking about a manager who’s listening to this show or an individual who’s thinking, “Okay, this sounds interesting. I’m not sure I have time to focus on it.” What’s the benefit? Jessica Rhodes: [00:28:06] You will be happier. The bottom line is if you are in a role where you are playing to your Strengths and where you’re operating within your Strengths, and when you’re working with other people who are operating within their Strengths, everyone is going to be energized and enthused, and that is going to make them happier. Lisa Cummings: [00:28:25] I love it. Thank you so much. This has been a blast. And I know now why the named the state of Rhode Island after you. Okay, so you know everybody wants to get a little bit more of you. How can they find you? Jessica Rhodes: [00:28:36] I would love for everyone to just check out my blog JessicaRhodes, that’s R-H-O-D-E-S, JessicaRhodes.biz is my main website. You could find my blog there and then links to all my other websites are right there. You can find my podcast and my video show and my sales page and everything is from there, but JessicaRhodes.biz if they want to connect with me. Lisa Cummings: [00:28:55] Well, thank you, Jessica. And thank you, everyone, for listening to Lead Through Strengths. Remember, using your strengths makes you a stronger performer at work. If you’re always focused on fixing your weaknesses, you’re choosing the path of most resistance, so claim your talents and take them to the streets.